Investors may be able to make a bet on Shamu in 2013. 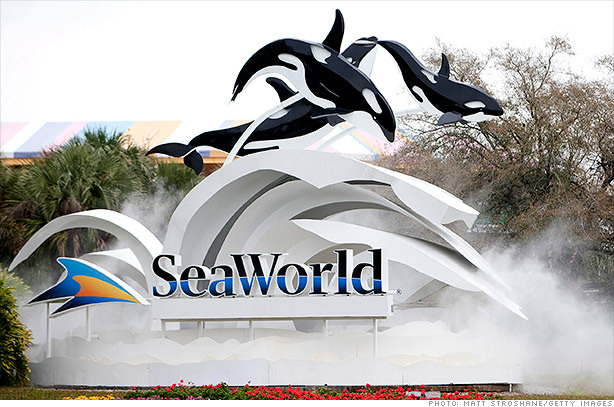 SeaWorld filed documents with the SEC Thursday that pave the way for a 2013 initial public offering. The amusement park operator, owned by private equity firm Blackstone Group (BX), will trade under the ticker symbol SEAS. The company said it would raise $100 million but that figure could change. IPO underwriters typically go through several rounds of investor testing to determine the right size and price tag for an IPO ahead of a company's debut. SeaWorld did not specify in the filing how many shares it would sell or at what price. SeaWorld plans to use the proceeds to help pay off its $1.8 billion of debt and to make a one-time payment to Blackstone. SeaWorld will use the remainder for general corporate purposes.Goldman Sachs (GS) and JPMorgan Chase (JPM) are the lead underwriters on the deal. In addition to its three main SeaWorld theme parks in Orlando, San Antonio, and San Diego, the company operates Busch Gardens and Sesame Place. Blackstone purchased SeaWorld from Anheuser-Busch InBev (BUD) in late 2009 for $2.7 billion. Under Blackstone's ownership, SeaWorld has increased both revenue and profits. For the first nine months of 2012, SeaWorld reported a 7.6% jump in revenue to $1.2 billion and a 72% profit surge to $86 million. Theme Parks have had a nice run in 2012. Six Flags (SIX) and Cedar Fair (FUN) are both up more than 40% in 2012. Blackstone's stock has gained just 9% this year.